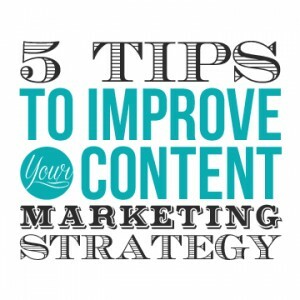 5 Tips to Improve Your Content Marketing That Also Applies to ALL Other Marketing. A big part of content marketing is telling your story. However, simply using words alone may not convey your message as efficiently as you want. Including multimedia in press releases and other marketing materials is a great way to help people visualize and clearly understand your story. It can also lead to higher response rates. Make information easy to digest. Most people only scan online content instead of reading it word for word. Format text into small pieces of information that can easily be scanned. Break it up into small easily digestible bits of information by using bullet pointed lists or separating information with headers. This will help visitors easily scan the content and pull out important information. Drawing people in to read your content requires catching their attention in the first place. Make sure your headlines are catchy and convey a sense of the value of the information provided. Be sure to incorporate keywords to ensure to catch traffic from web searches. Personal stories really stand out. Consumers don’t want to read through tons of messages about why and how your company is better than the other. They are interested in compelling stories about real people. Profiles of staff members, high profiles clients, or even small businesses in a related industry or the local community are a few ideas. With all the different platforms for media on the web you can end up with multiple aspects of your message distributed separately leading to some being lost on the web. You should find ways to package all relevant aspects of your message together. You could create an email newsletter, embed your youtube videos into your blog, display social media feeds on your website or blog, etc. There are a number of ways to make sure all aspects of your content marketing campaign are distributed effectively through the web, find what works best for you.